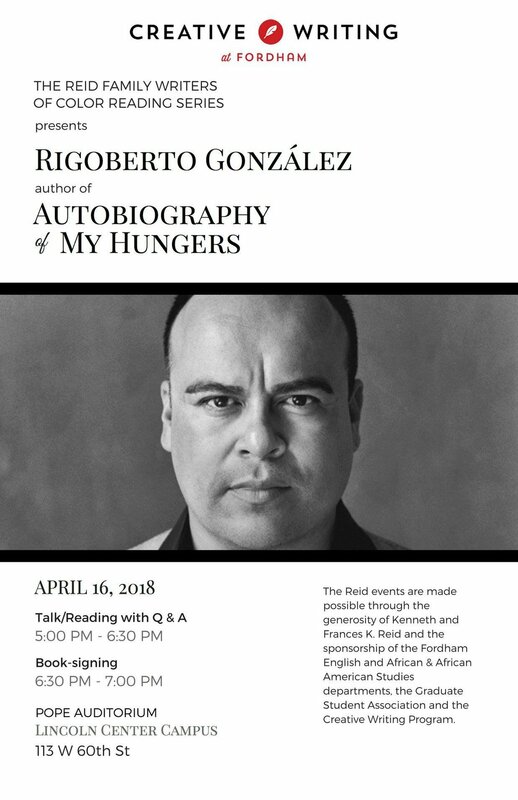 Rigoberto González, author of Autobiography of My Hungers, spoke on Monday, April 16, at 5pm in Pope Auditorium on Fordham University’s Lincoln Center Campus. 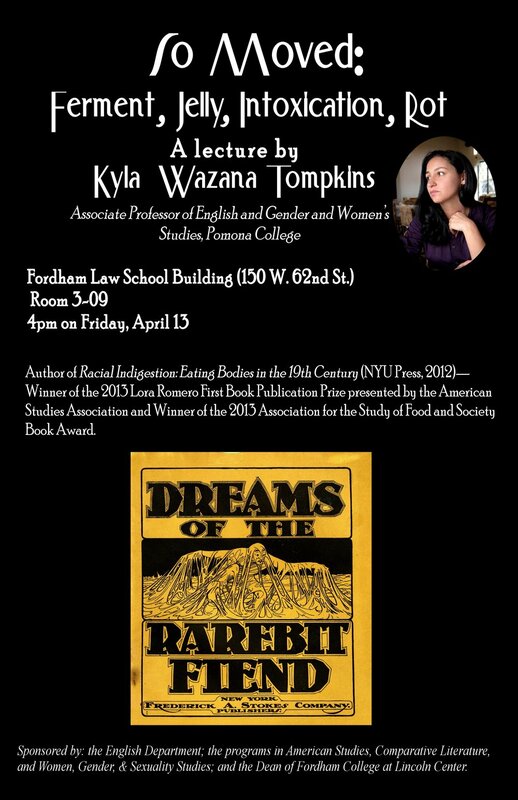 His visit was part of the Reid Family Writers of Color Reading Series, which since 2008 has brought some of the most celebrated writers of color to Fordham. Events have included readings, master classes and panel discussions. The English Department at Fordham is deeply grateful to the Reid Family for their continuing generosity. Rigoberto González is the author of four books of poetry, most recently Unpeopled Eden, which won the Lambda Literary Award and the Lenore Marshall Prize from the Academy of American Poets. His ten books of prose include two bilingual children's books, the three young adult novels in the Mariposa Club series, the novel Crossing Vines, the story collection Men Without Bliss, and three books of nonfiction, including Autobiography of My Hungers and Butterfly Boy: Memories of a Chicano Mariposa, which received the American Book Award from the Before Columbus Foundation. He also edited Camino del Sol: Fifteen Years of Latina and Latino Writing and Alurista's new and selected volume Xicano Duende: A Select Anthology. The recipient of Guggenheim, NEA and USA Rolón fellowships, a NYFA grant in poetry, the Shelley Memorial Award from the Poetry Society of America, The Poetry Center Book Award, and the Barnes & Noble Writer for Writers Award, he is contributing editor for Poets & Writers Magazine and writes a monthly column for NBC-Latino online. Currently, he is professor of English at Rutgers-Newark, the State University of New Jersey, and the inaugural Stan Rubin Distinguished Writer-in-Residence at the Rainier Writing Workshop. In 2015, he received The Bill Whitehead Award for Lifetime Achievement from the Publishing Triangle. As of 2016, he serves as critic-at-large with the L.A. Times and sits on the Board of Trustees of the Association of Writers and Writing Programs (AWP). Since 2016 he has served as critic-at-large with the L.A. Times and on the Board of Trustees of the Association of Writers and Writing Programs (AWP). González also led a Craft Class and met with students and others on Monday afternoon. His 5pm reading and talk were be followed by a book-signing. This year’s Reid events were made possible through the generosity of Kenneth and Frances K. Reid and the sponsorship of the Fordham English and African & African American Studies departments, the Graduate Student Association, and the Creative Writing Program. On Tuesday, April 25th, Robin Coste Lewis will read from her award-winning book, Voyage of the Sable Venus, at the 2017 Reid Family Writers of Color Reading Series. Robin Coste Lewis is a Provost’s Fellow in Poetry and Visual Studies at the University of Southern California. In 2015 she published her stunning poetry debut, Voyage of the Sable Venus. This first collection is one of surpassing imagination, maturity, and aesthetic dazzle. It was widely praised by critics and honored with the 2015 National Book Award for Poetry—the first poetry debut to do so since 1974. Lewis is a Cave Canem fellow and a fellow of the Los Angeles Institute for the Humanities. She received her MFA in poetry from NYU, and an MTS in Sanskrit and comparative religious literature from the Divinity School at Harvard University. A finalist for the Rita Dove Poetry Award, she has published her work in various journals and anthologies, including The Massachusetts Review, Callaloo, The Harvard Gay & Lesbian Review, Transition: Women in Literary Arts, VIDA, Phantom Limb, and Lambda Literary Review, among others. She has taught at Wheaton College, Hunter College, Hampshire College, and the NYU Low-Residency MFA in Paris. Lewis was born in Compton, California; her family is from New Orleans. The Reid events are made possible through the generosity of Kenneth and Frances K. Reid and the sponsorship of the Fordham English and African & African American Studies departments, the Graduate Student Association and the Creative Writing Program. On Thursday, October 6, Lee Child presented a lecture on "The Social Value of Crime Fiction" in celebration of the Mary Higgins Clark Chair in Creative Writing. Child is a best-selling author and creator of the "Jack Reacher" series. Higgins Clark (FCLC ’79) has written 42 books which have sold 100 million copies in the United States alone. A $2 million pledge to Fordham University by the alumna has made the endowed chair in her name possible. The Mary Higgins Clark Chair in Creative Writing will bring distinguished authors in a variety of genres to lead workshops, seminars and master classes to upper-level undergraduates and graduate students at Fordham. The Reverend Robert T. Grimes, S.J., Dean of Fordham College at Lincoln Center, and Leonard Cassuto of the English and American Studies Departments introduced Child and his work before turning the podium over to the lecturer himself. Before beginning his lecture proper, Child shared fond memories of time shared with Higgins Clark and details of how her work has influenced him as a writer. He cited his number one reason for accepting the honor from Fordham as the opportunity to compliment Higgins Clark "without her shushing or slapping me." "Mary Higgins Clark is a friend to any mystery writer in the New York metro area. She is a distant and glamorous figure that became my friend. She is a fountain of advice and an example." Child situated his lecture some 200,000 years ago by asking the question "Why would humans invent storytelling?" If everything that humans did at this evolutionary stage was to enhance their chances of survival, Child reasoned that fiction must have served such a purpose and continues to do so today. Lee posited that crime fiction and suspense are sources of encouragement that make people believe that they can face danger and survive it. "Mary's stories put an ordinary person—often a young woman—in peril, agony, doubt, fear, and 300 pages later, she has survived." "Storytelling is all about consoling yourself, empowering yourself, getting things you don't get in real life. Very frustrating realities are worked out in the fantasy worlds of thriller and crime novels." Following Child's Lecture, Higgins Clark briefly addressed the audience to thank Child and the University. She reflected on her relationship with Fordham and her life as a writer, saying, "The one gift that God gave me was to be a writer and it is a blessed, blessed, blessed gift." The Reverend Joseph M. McShane, S.J., President of Fordham University, closed the night's ceremonies with reflections on the lecture and praise for Child and Higgins Clark. "I'm a huge fan. I take Jack Reacher with me on every flight I go on when I go fundraising—and now I know why. I came to this evening as a fan and I leave as a student." CURA: A Literary Magazine of Art & Action celebrated the launch of Issue No. 17 "Breaking Stone" with a Harlem Renaissance themed speakeasy last Thursday. The Spring 2016 issue features poetry by Pulitzer Prize winner, Tracy K. Smith, an experimental short film by Ruth Ellen Kocher and more. The event featured poetry readings by Quincy Scott Jones, Laura Swearingen-Steadwell, and the winner of the 2016 Reid Prize Kat Sommers. Guests enjoyed a chocolate fountain and artisanal chocolate tasting and toasted to "Breaking Stone" with an open wine bar. Fordham students Marla Louissaint and the Fordham Jazz Collective set the speakeasy mood with their musical performances. To learn more about CURA and the 2015 - 2016 issues dedicated to Black Lives Matter, visit curamag.com. Join us on Wednesday, April 27th at 7 p.m. in Fordham Lincoln Center's 12th Floor Lounge for the Creative Writing Prizes Reading. The winners of this year's prizes will read and a cupcake reception will follow. See below for a full list of the prizes and this year's winners. Wallis Monday for selections from Mythmaking — "Hemingway and John Wayne Walk into a Bar" and "To the Cemetery Voices"
Danni Hu for "Female Perversion"
Wallis Monday for selections from Mythmaking — "Mapmaking" and "Inventory"
Diana Shao for "Shadow Play"
Connor Mannion for "Mojave Whiskey Weather"
Bo Fisher for "Washing Jean Jackets in West Jeff"
Elizabeth Shew for "The Distance Between Two Skins"